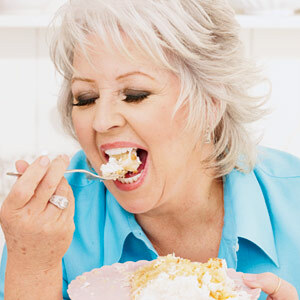 I’m not a big fan of Paula Deen – the mere thought of all that butter just makes me throw up in my mouth a little. My dad the dairy farmer loves Paula Deen because, according to him, she is single-handedly keeping the U.S. dairy industry afloat. An aside: My mom bought me a gift subscription to “Cooking with Paula Deen” magazine. I feel so bad (and no one out there better tell my mom this), but I don’t read it – at all. It’s too disgusting to even look at. She also bought me a subscription to “Everyday with Rachael Ray”. She knows how I feel about Rachael! But, that’s a blog post for another time. Please, Mom: I read “Cook’s Illustrated”, “Cooking Light”, “Martha Stewart”, and “Food & Wine”. Any of those would make a great gift, along with a date with Alton Brown. If you can swing it. Back to Paula Deen. I’m here to share the madness. In this video from her popular Food Network show, Paula makes a sandwich involving a hamburger patty topped with a fried egg & bacon, in-between 2 Krispy Kreme doughnuts. She calls it the “Lady’s Brunch Burger”, and it’s one of her most popular recipes. Fast-forward to about 6:37 in – when you can hear a “SQUEEEEEEEEEK!” It’s your arteries closing. Next Next post: Free Cupcake at Price Chopper – TODAY ONLY! Like Communism, family vacations, and all-night Barbarella marathons, Paula Deen is much better in theory than in practice. Barbarella! Who thought that was a good idea? Not to point fingers or anything, but that may have been you. My memory of events, however, is surprisingly unreliable…. Let’s blame Martin. He’s in France. I can agree to that – now that I think on it, it was totally his fault. Ok, so I bring Aaron to the world of Wendalicious and show him this. He insists on watching the video and is screaming in pain throughout the entire grits-making part and even more so during the sandwich assembly/consumption. Tell Aaron I’m sorry, but the world needs to know about this.